As I reached the bottom of the steps, I turned around to find that UOPETA, THEXIS and THEROS had made quite a bit of progress in my absence, although it seemed THEROS and THEXIS had swapped jobs. I went towards the end of the tunnel, where they were still working to fetch THEROS. I needed him with me when I spoke to COLUS to pinpoint where I had surfaced. From there, we could determine the approximate distance we had to travel in the new direction before heading towards the conducting tower more inland. "What did you find? Any indication of how far we've come? Could you see the conducting tower...?" That was what I was initially looking out for, but my view was obscured by a hill which, after scaling, I found a much better landmark. A landmark which pinpointed our position almost exactly! If I had seen the conducting tower from where I was, I might not have scaled the hill to then find the cave system we had previously visited, so our position would be placed on an inaccurate guess. It would likely have resulted in bringing THEROS back to the surface with me so determine approximate distance based on scale and the distance we'd travelled in comparison to the map. "Really? The one that went to when we were destroying secondary portals from the report we found at the tower?" "Well we couldn't ask for a better position then! I can tell you exactly where we are then on the map, and then work out the distance to the tower based on the tunnel length." THEROS followed me back up the tunnel and past OROTHO and Joe, who were working silently, for a change, on the next door system. Heading back through the entrance into the lab, we found COLUS in the discussion room with Amie, presumably to get away from the sweltering heat of the furnaces. They stopped working as we approached. Sitting down, THEROS produced the map from his pocket and laid it flat out on the table. "Syeonyx has found out where we are currently with the tunnel. After making a surface hole, he found that our tunnel ran a few metres to the West of a location we've already visited before! On one of the excursions to the tower to find portal locations, we were directed to this location where a potential secondary portal was active. From knowing that, I can pinpoint exactly where our tunnel is, and based on the distance we continue against the scale of this map, I can predict with a reasonable degree of accuracy where we need to stop mining the tunnel." "Excellent work Syeonyx! We needed something like this to keep us on track. So, where was it you ended up surfacing?" "According to his description, our tunnel runs a few metres past this point..."
THEROS pointed on the map to where I had surfaced, which was at the exact point where one of the secondary portal icons had been crossed out. From looking at the map, and trying to compare the area with an aerial representation of it, I was very confident that THEROS had accurately located the place. "This progress is brilliant! We just need to stay on course and we should be linked with the conducting tower in no time! After that, we can extend the tunnels to places further out. Right, go back and destroy the surface hole and continue with the good work! 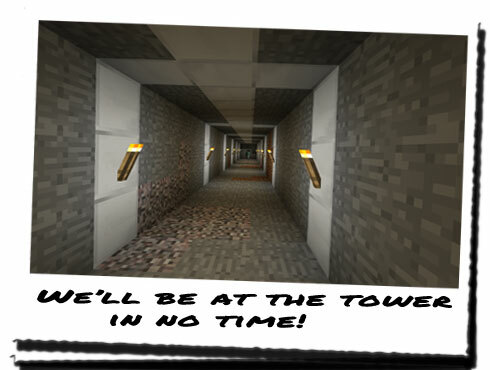 At this rate, we could be making another surface entrance to the tower in a day or two!" Leaving the map with Amie and COLUS, we stood up and headed back for the lab. Everything was running smoothly. Better than smoothly! I was just worried that something was going to come along and ruin our work, but I kept it to myself to prevent the possible spread of panic in such an instance. I'd probably jinx it if I said anything anyway!